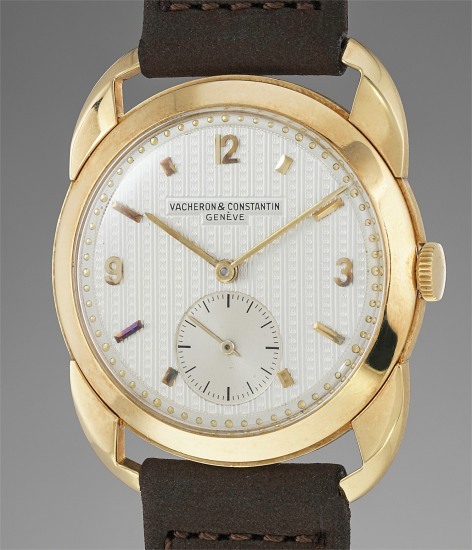 Accessories: Accompanied by Vacheron Constantin Extract from the Archives confirming production of the present watch in 1950. The two decades stretching between the 1950s and 1960s are an extremely prolific period for watchmaking design. One notices a strong trend toward dials featuring less and less graphic elements in favor of unusual textures, colors and materials. The case design as well follows a similar road with architectures based on - sometimes - very elaborate shapes. The present watch fully exemplifies this trend in both case and dial. The latter is indeed without virtually any graphic element other than the signature and the second divisions in the subdial. It is however decorated with a very elaborate guilloché decor, long baton, short baton and Arabic numerals in gold, and outer beady minute divisions also in gold. The case features an equally interesting design, most notable for the highly prominent fancy lugs which vaguely resemble a crab claw and give the name to this reference: Crab Lugs. Offered in remarkable condition, the present piece is a perfect example of 1950s watchmaking design which will not fail to surprise and impress the connoisseur of vintage watches.